Again this is one of those ‘no-brainer’ gadgets, so why doesn’t this exist? Is it the stigma of the Grand Theft Auto franchise? Or does Rockstar refuse to merchandise the brand? Either way, I think this is one of those Art-imitates-life devices that gamers would enjoy. 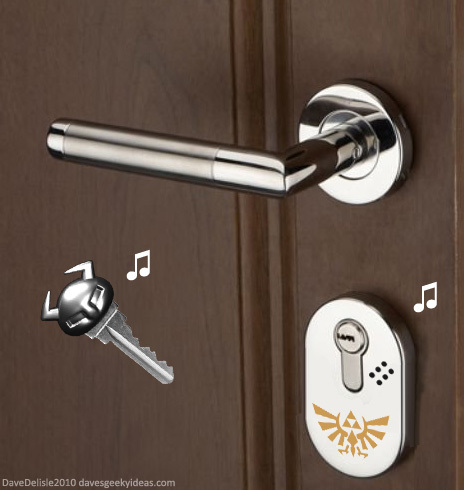 Wouldn’t it be neat to hear a familiar video game chime when you unlock your front door? Like the sound when opening a dungeon or treasure chest in a Zelda game. Suddenly the mundane task of entering or exiting your home would sound like an adventure. I feel that creating a deadbolt with a speaker would be the best way to accomplish this. Another way is to incorporate a sound chip into the key itself, but that would be difficult to create an electronic key fob that will fit onto any key. Special thanks to my friend Matt Rose for suggesting the latter idea (the chime built into the key). UPDATE: You might have noticed that Zelda chime when the door rang at the beginning of the Scott Pilgrim movie! I think an accompanying door bell would be great too.